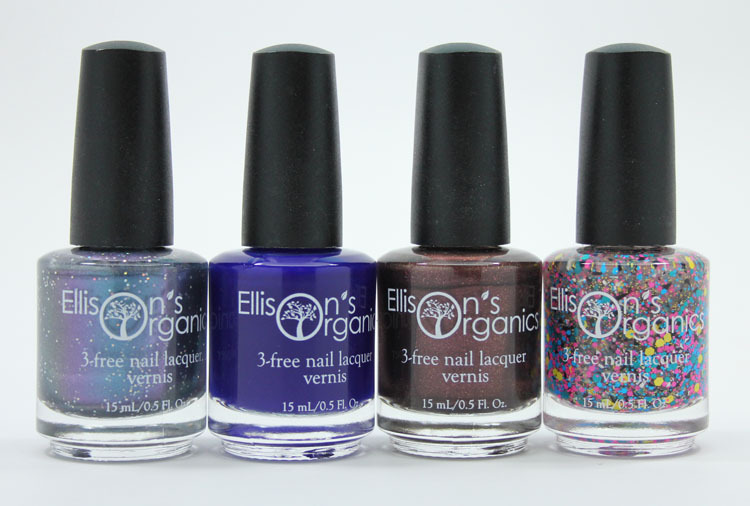 Ellison’s Organics 3-Free Nail Lacquer is an indie brand that started selling bath, body and nail products in 2012. I recently had the chance to try out some of their nail shades and am very impressed! Currently there are about 50 nail lacquer shades and the four I have today are all vegan, 3-Free, cruelty-free and made in the USA. Three of these that I have are from their special Dr. Who collection and one other is a random shade. One of them called Bigger on the Inside made an appearance at NYFW in a celebrity gift lounge to much success. Cool! All of Time and Space (Dr. Who collection) is a dark blue with a dark purple shift and small holographic hex glitter scattered throughout. Great shade and very unique! I love the blue/purple shift and the glitter really does make it look like galaxies or something from outer space. This was two coats and it’s just the slightest bit brush-stroke-y, but not too bad. Bow Ties are Cool (Dr. Who collection) has a deep maroon base and it’s filled with red shimmer. I love this color, especially for this time of year. It’s a really rich color, very shimmery and it applied perfectly with just two coats. Bigger on the Inside (Dr. Who collection) is a deep royal blue crelly. It’s both deep and bright and super shiny. I did need three thin coats to get it more even and pigmented on me, but that’s typical for a crelly/jelly formula. Pretty! Breakfast Club has a clear base and features multi-shaped and multi-sized glitter pieces in black, neon yellow, neon pink, blue and teal. The second I saw this one in the bottle I was in love. I am not usually a glitter fan, but this speaks to me. I think it’s because I am a child of the 80’s and the Breakfast Club happens to be one of my favorite movies ever (saw it in the theater with my mom when I was 12!) The colors and shapes are just 80’s perfection. This is two coats dabbed on over a white polish. Easy as pie to apply this way, love it. I love trying out new indie brands and I am super pleased with this line. It makes it even better that they are a responsible company, cruelty-free and made in the USA. I highly recommend trying them out. You can find them on their Etsy page here and they are $12.00 for 0.5 oz. Is this a brand you have tried or want to now? Which of these shades excites you? 48 hours later, Zoya Kalista going strong! Bigger on the Inside is a gorgeous blue!!! I LOVE IT!!! All four of these are stunning, but I really love Bowties are Cool. I love the Dr. Who collection! 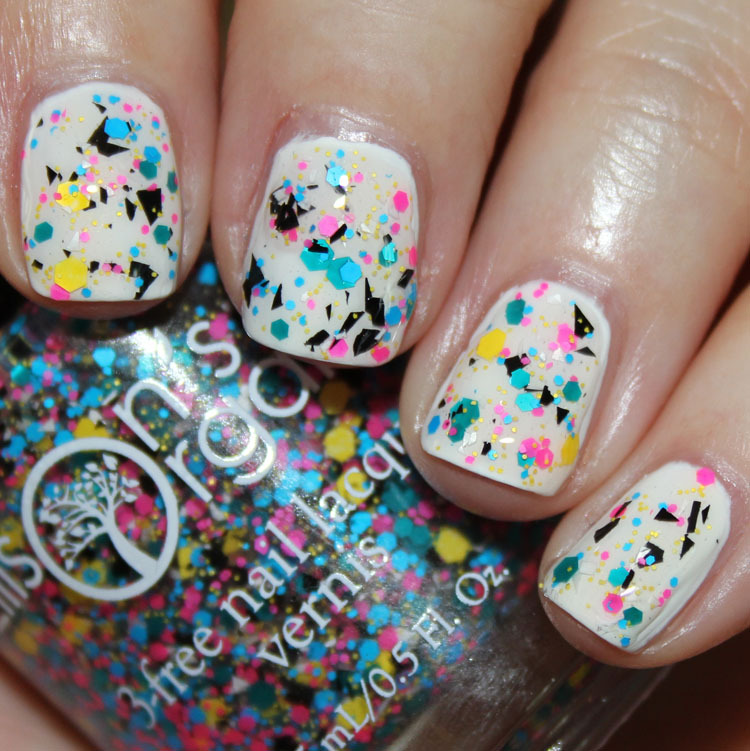 I looked at the pictures before I read any of this, and I saw Breakfast Club and thought it was the perfect 80s polish! Totally awesome! All of these colors are pretty! Love Breakfast Club! Such a fun topper! I’m totally with you, Kelly! Breakfast Club is amazing and perfectly named. When I look at it, it reminds me of all the bright colours from the 1980s! Love it!